A day of dark age gaming at Entoyment games store POOLE Dorset. Players had 2 or 3 games in the day. Here are just a few taster pictures showing the "action". Rules used used are "Longships-Wrath of the Vikings". The games were restricted to land raids. So battles were not used, nor were river landings. The games were enjoyable. rapid, straightforward and absorbing! 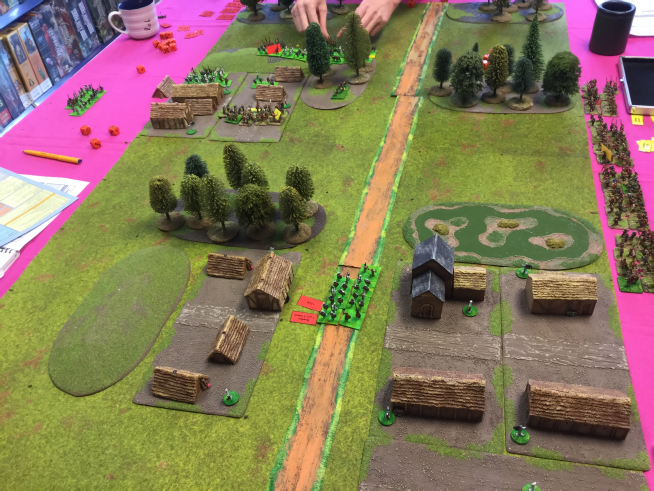 All games were fought in 15mm. Armies present were Viking, Irish, Welsh and Saxon. Not a single Scots army. Each army has 5 units. The defender starts with few on table, but they do amass. The raider needs to judge when his superiority is waning and when to leave. The defender might prevent this. A fine day of gaming. Good location, good game and good players. Next one 2nd March 2019. The Welsh king and his personal bodyguard are in the near end of the far village . Two Viking units are to their left and front. Another Viking unit has moved down the road to the bottom right. They are getting on with the raid, whilst their other units engage the King. This is early in the game. 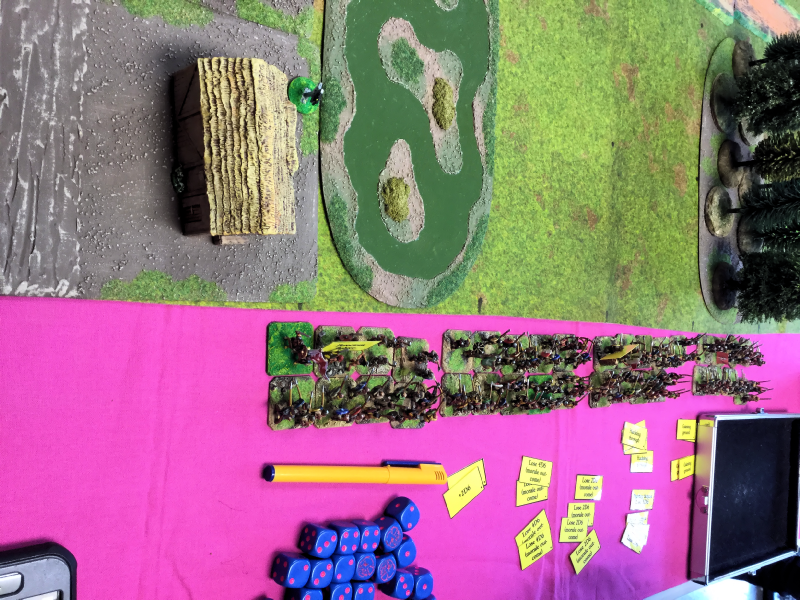 The Welsh army has 4 units off table, waiting to arrive. 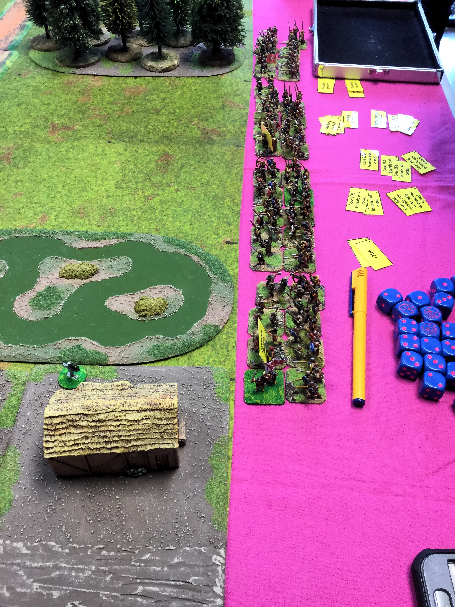 Only the King's personal unit has turned up on table so far! Lead Viking unit moving down the road. It is too easy to get distracted by defenders, instead of getting on with the raid. If the raiders stay too long, more and more defenders turn up. using the road allows for faster movement. 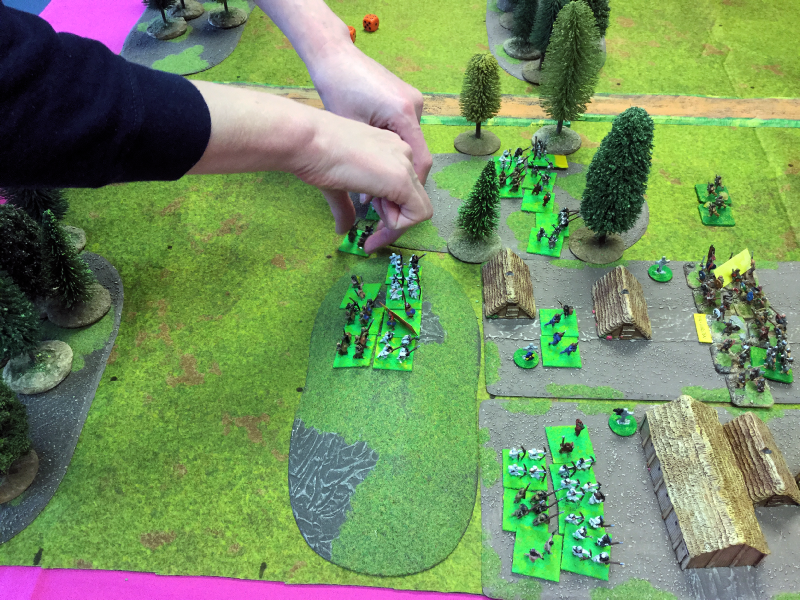 However being in a march column is very dangerous if attacked by a defender unit. Sometimes the Gods interfere in the doings of warriors. Aggressive Viking troops assault. To the left of this picture are 3 main ship crews (each Viking unit is comprised of a ship crew, whilst raiding) . In the very centre are a group of skirmishers. 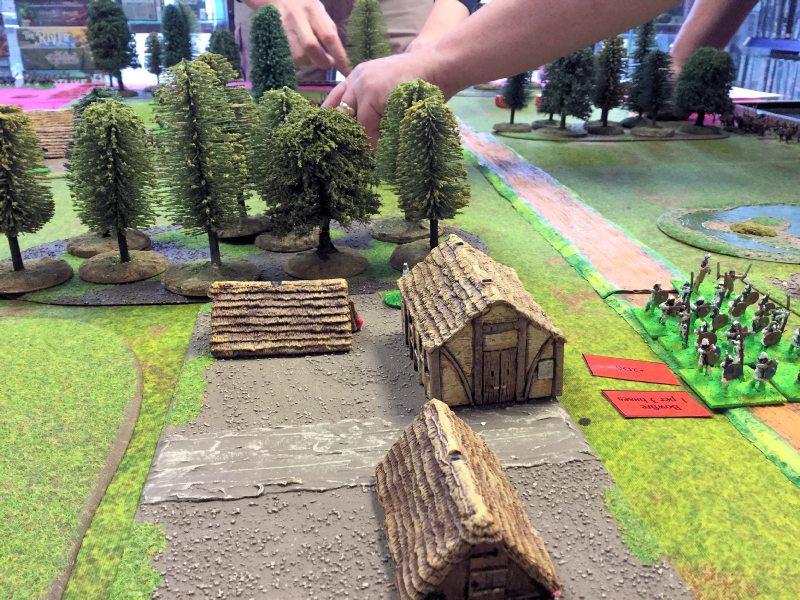 Moving through a village in battle line is a slow process. The unit on the right IS in trouble. Maybe they can stare off the Vikings for a turn or two? Help is surely on the way. 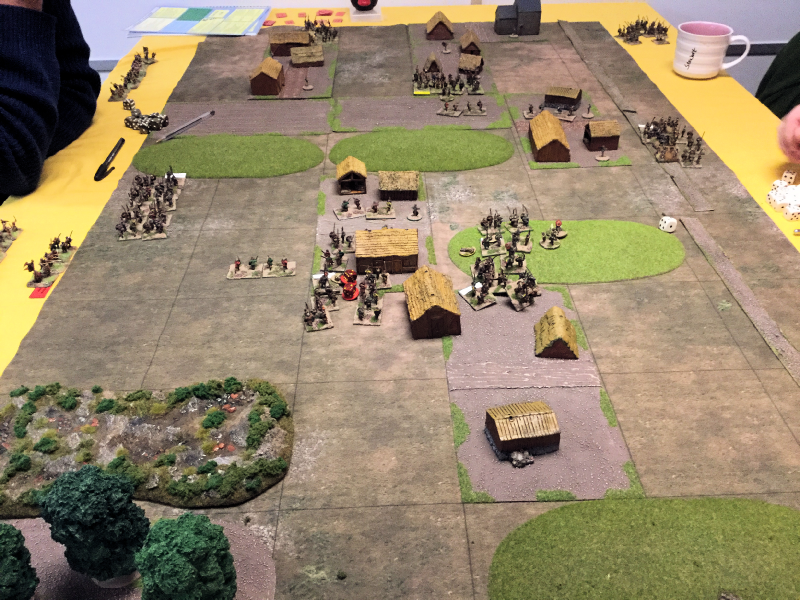 The Saxons are defending. that is them in the distance with the yellow flash. All the other units are Irish. This is near the game start. The Irish have little in the way of armoured troops, but do deploy a lot of harassing skirmishers. The scenery is open, with marshes, crops and gentle hills. Idyllic. the Irish have swept the near villages. Notice the Irish are in march column in order to cover ground quickly and keep the shock element of their raid. The white tags on unit leader bases give the names of those leaders. 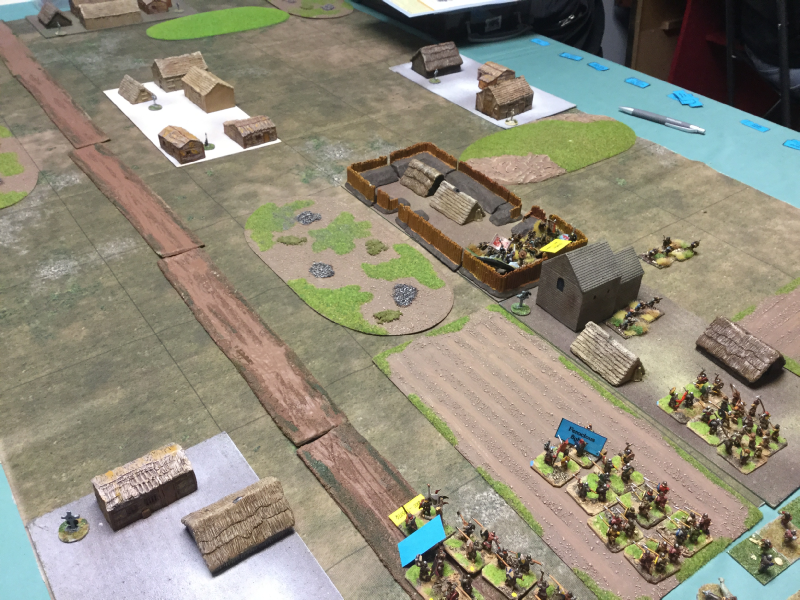 To the far left, the leading Irish skirmishers are contacting a Saxon guard unit. The initial Irish response was to guard the area by using a palisade and guard unit. There they are at the top of the picture. 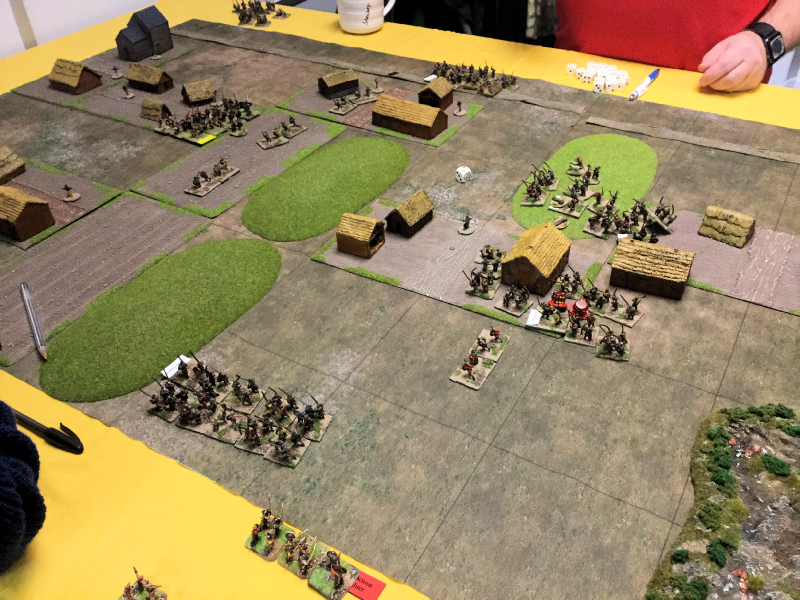 The Saxons are coming on fast, in march column. They (Saxons) will need to deploy into battle line and shield wall before assaulting. 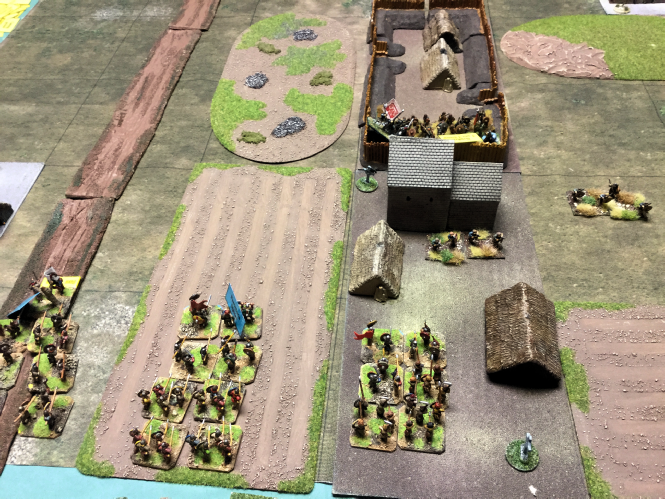 The palisade is tough nut to crack, but the Saxons might just bottle them up in there, whilst carrying out raiding activities. Yellow flash on picture left shows position of Saxon earl. scenery is again very open.